Benjamin Hart (Founder, Podcast Co-host): It's hard to put into words how much of an impact Carrie had on all of us, and how much we will miss her. In the films she played a Princess, but in real life she was true royalty. Being a part of Star Wars' original "big three" was enough to make anyone a modern legend, but Carrie went above and beyond that. 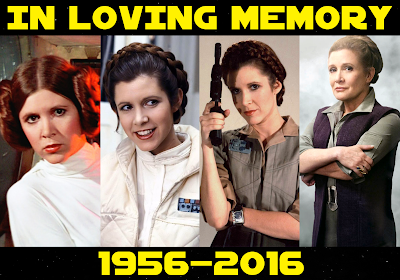 Appearing at countless Star Wars Celebrations, Comic Cons and other conventions and events over the years proved how important we, the fans, were to her. And her impact on pop culture and the World abroad will continue to be felt for generations to come. Her portrayal of Leia in the Original Trilogy continues to inspire Women(and men) young and old to this day. She realized a character that broke the mold for female protagonists and proved once and for all that girls can be great heroes just like boys, if not greater. Later in life Carrie would defy the odds, and her critics, again by returning to the role in The Force Awakens. She brought a moving performance to the screen once again and breathed life into Leia in a brilliant way in this new era. As sad as I am to see her go, I feel privileged to have bore witness to her many talents, to have the opportunity to see her on stage at Star Wars Celebration, and I can't wait to watch her one last time in Star Wars Episode VIII. The Force of Carrie Fisher will be with us... always. Dominic Jones (Head Writer, Podcast co-host): "Into the garbage chute flyboy!" This was always the line the best summed up Princess Leia for me. Even in the midst of her own rescue, she took charge and let everybody know exactly what she was thinking. There is no denying the impact and the legacy Leia left on cinema and millions of people around world. She was tough, she was smart, and she never stopped fighting. The same can be said of Carrie Fisher. In her last book The Princess Diarist, Carrie wonders on the page, "Am I Princess Leia, or is she me? Split the difference and you'd be closer to the truth". In this moment of retrospection we find clarity: Carrie Fisher is Princess Leia and Princess Leia is Carrie Fisher. Without Fisher, Leia would not have been possible. Fisher brought so much more to the role than just her face and acting ability. She instilled all of her best qualities in Leia, something that would become evident throughout her life. Carrie faced her share of demons and, much like Leia, she never gave up, always coming out the other side with a smile and witty comment. Fisher's outspoken nature about her mental illness would have made Leia proud, as it did so many of us. She spoke openly about the challenges she faces, helping to fight the stigmas that surround mental illness. In the process, she inspired us again, just as she had when she helped topple the Empire. Carrie Fisher will always be remembered as Princess Leia, but her legacy stretches far beyond even Star Wars. For her work in a galaxy far, far away, as well as here on Earth, she will live on in the hearts and memories of so many. She was an inspiration and a hero. Chris Seekell (Webmaster, Podcast co-host): It was the summer of '96. I was about to turn five, and was enjoying a new, fledgling hobby... running to the Star Wars aisle of every store. I had gotten a stormtrooper with a man under the helmet in the mail after watching that space movie, and had sold a few toddler toys in a yard sale for change to go to the store and look for more. It was then, when a child who had started growing up on Thomas the Tank and Lion King, looked up and saw an orange piece of cardboard, with a menacing helmet in the corner and a woman clad in all white holding a blaster hanging on the peg. Immediately, I remember turning to my mom and saying, "I want this one!" She looked a little apprehensive, then after a moment whispered, "You already have it. Just wait until your birthday." My cousin, who had grown up with the original Star Wars movies, had heard I had taken an interest in them, and had given me the first of many cherished Star Wars gifts. As a young boy, who knew nothing about the world, I took for granted that Leias, and later Padmes and Ahsokas, were scattered throughout the "boy section" of stores. I grew up playing with the action figures, watching the Star Wars movies, and not until I was older, did I begin to realize in what an incredible time in history I was born. I began to realize, that George Lucas and Carrie Fisher had changed the world, and made it a better place for not just me, but more importantly, my sister. I remember giving her a Leia figure for her birthday one year, just as my cousin had given my first to me. And now, every time that I see a woman leading the way in the summer action blockbuster on the big screen, or a little girl waving a Nerf blaster around, I remember, Carrie did it first. There are some people who we remember for who they were, and there are others that we will forever see through the indelible mark they left. Carrie Fisher's star will never fade, and because of brave souls like her, in this dark world we still have hope. Ciaran Duggan ("Live From Lothal" host): Carrie Fisher will be forever remembered as the Princess of Star Wars. For me though, Fisher’s acting legacy lives far beyond that and is rooted in a fast becoming antiquated era of Hollywood cinema. I’ve always admired Princess Leia, and the way in which Carrie portrayed her. Leia was tough and feisty which was hugely important because her character became an inspiration to women across the globe. Carrie’s character helped break an outdated stereotype of women in cinema, and in real life. The notion that an actress had to play a damsel in distress in western/sci-fi/war movie had been shown for what it was – a myth and nothing more. I will always remember Carrie as “Princess Leia” not merely because she is a character I adore in the saga, but because her character became a cultural icon for future cinematic heroines in generations to come. Zac Arnold (The Intergalactic Peace Coalition Podcast host): My heart aches. As far back as my memories can take me, Star Wars has always been there. The iconic trio of Han, Luke, and Leia have always carried that interest. The fan in me mourned when “Han Solo” died, but the human in me is a mess. We’ve lost the woman behind the princess. She was so much more than the buns or the gold bikini, she was an ambassador to the franchise. She gave young people hope, confidence, and joy for decades. Her battle with Bipolar disorder was also a huge part in her life. Spearheading awareness for that as much as attention for Star Wars is something I will always remember. I have many friends who have BPD that looked to her for inspiration. “If Princess Leia can do it, so can I.” She carried all her mantles with tact and grace, none more so than her return to the franchise. Seeing her CGI face at the end of Rogue One will always mess with my emotions, as I’m sure Episode VIII will as well. She’s one with the Force now. Mourn her we should not. Miss her we should not. But I can’t help it. Tyler Westhause (SWU Contributor): Carrie Fisher was a champion of mental health. That is what I will most remember her for. Her work as Princess Leia throughtout the Star Wars franchise has had a major impact on my life, yes. It has inspired me creatively, yes. It has helped make me stubborn person I am today, yes. But it hasn't impacted me the way Carrie Fisher's mental health work has. She looked in the face of bipolar disorder and depression, and smirked. She said screw you. That's what I'll remember her for. That's why I'll forever miss Carrie Fisher. Lillian Skye (SWU Contributor): My earliest memory of Princess Leia was seeing her stand up to Darth Vader in A New Hope. She didn’t shy away, and she didn’t show fear or let on that she was afraid--even though she might have been terrified in the presence of darkness. Instead, she confronted Vader. She looked him in the eye and showed Vader that she was not afraid of him or what he could do to her. In many ways, this first impression I have of Leia is who I have always associated with Carrie Fisher. Carrie was a strong, courageous woman who radiated confidence. Even in times when she could have felt vulnerable, she didn't shy away. She shared her experiences with others, and never let anything hinder her. An outspoken mental health advocate, she wasn’t ashamed of her struggles, and she was constantly encouraging others to be strong. Read the thoughts of Carrie's friends and colleagues on her passing here.